Emerald or also called Emerald is a gemstone or precious stone that is green to dark green. Emerald includes beryl silicate minerals (containing beryllium) and the green color is caused by chromium trace. The presence of vanadium and iron accompanying the chromium trace will cause a variety of zones in the green color. Emerald violence is high (7.5 on the Mohr scale). Emerald is a gemstone of a type of green beryl mineral with trace amounts of chromium and sometimes vanadium. Emerald is an interesting gem because it has the most beautiful, the most intense and the most radiant green that might be imagined: emerald green. Inclusion is tolerated. In the best quality, the best emeralds are even more valuable than diamonds. The best emerald comes from Colombia, because the green color is more concentrated and crystallized. Emerald has a unique inclusion that is the presence of crystal inclusions in the form of cracks (cracks) or a distinctive gap from this gemstone. 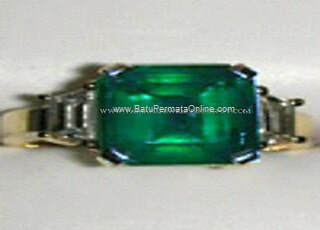 Emerald is the most valuable stone in the beryl group. The beautiful emerald green is unmatched in the world of gems. Unlike other beryl gems, Emerald often contains inclusions and other disadvantages. 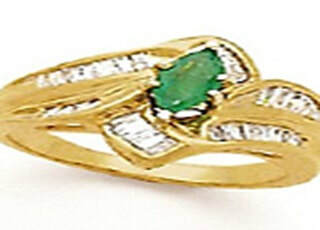 These disadvantages do not appear to be negative aspects of emeralds as they would for other gemstones. Indeed, these shortcomings are considered part of the character of stone and are used to guarantee buyers of natural stone. High quality Emerald producers are Colombia, Siberia, South Africa, Zimbabwe, Australia & Brazil. Stone aura: creates a cool, safe and comfortable atmosphere, maintaining physical and spiritual freshness. Scientifically, color is divided into three components: hue, saturation and tone. Yellow and blue, green are found adjacent to the spectral color wheel, which is the secondary color normally found in emeralds. Emerald occurs in shades of color ranging from yellow-green to blue-green. The primary color must, of course, be green. gems Only those that are medium to dark in tone are considered emerald. Light-fast gems are known as species, green beryls. In addition, the color must be bright (alive). Gray is a normal saturation modifier or mask found in emeralds. A grayish green color is dull green. Natural emeralds tend to have inclusions and broken surface cracks. 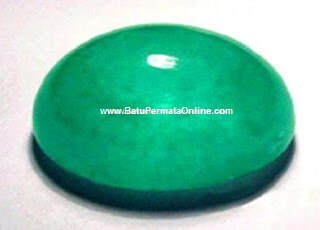 Unlike Berlian, where the standard is enlarged, 10X magnification is used for class clarity, Emerald is valued by the eye. So, if an emerald does not have inclusion it can be seen with the eye (with a normal visual assumption) it is considered perfect. The surface of the stone that does not violate fissures is very rare and therefore almost all emeralds are treated, Oiled is "oiled", to improve clarity. Eye-clean stones of the main living green color with no more than 15% of each secondary color or combination (either blue or yellow) of the highest-order middle-dark tone. 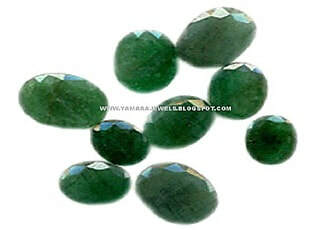 These relatively non-uniformity crystals make emerald more likely than other gemstones that will be cut into Cabochons, rather than the shape of the sides. Many gemstones are green, but Emerald green is the one that is considered the most enchanting. As a mineral, Emerald is a type of beryl group. this type of beryl actually has the colors blue, yellow and red - but only the green color that is cool and calm is what makes it appear parallel to other noble gems. Uniquely, the majority of emerald minerals are born with natural characteristics such as cracks or fibers so that if you can find one that is good and has a smooth color. This is it! Want to know the price? in the free market an emerald almost perfect and large can be valued above US $ 10,000.00 per carat. As a gemstone, Emerald looks the most elegant and ideal when honed facet models in the form of rectangular pieces or emeralds (emerald-cut), so that he is very loved by men who will feel proud if you can use it as an eye ring with dripped diamonds on the edges. It's great. Lowest Value: This emerald is so opaque. emerald color is dark and less attractive. This emerald / emerald is small and less cut. Emeralds like this aren't very useful. High Value: This emerald has clarity (Clarity) that is less than before. However, intense luminous colors and large size make it more valuable. Top Value: This emerald has better clarity (Clarity). The intense luminous color and large size make it more valuable.